← Possibly the most irritating thing about British Airways. While Hitler makes his feelings about this incredibly dumb decision by Google very clear, mine are more conflicted*. I have previously mentioned regularly scanning many web sites, and was one day going to describe them and how I get to do that. Sadly, Google may take away the ability to (easily) do this before I get round to the description The tool that I, and I think almost everyone who needed a fast means of accessing favorite sites, was Google reader. This was a web-based server, brilliant in it’s simplicity, that existed only to scan the RSS feeds of web sites, and present them in a clean and simple way. The best part about it was that the interface was open, so many Android or iThing apps could access it, and then present the feeds locally on one’s tablet. The app trend these days has been to dress RSS feeds up like a some glossy ersatz version of What Car magazine, filled with images, and light on text. For those that just wanted the copy, quick and clean, a Google reader account plus an app like Greader on Android (IMHO far and away the best app for this) was a superb solution. 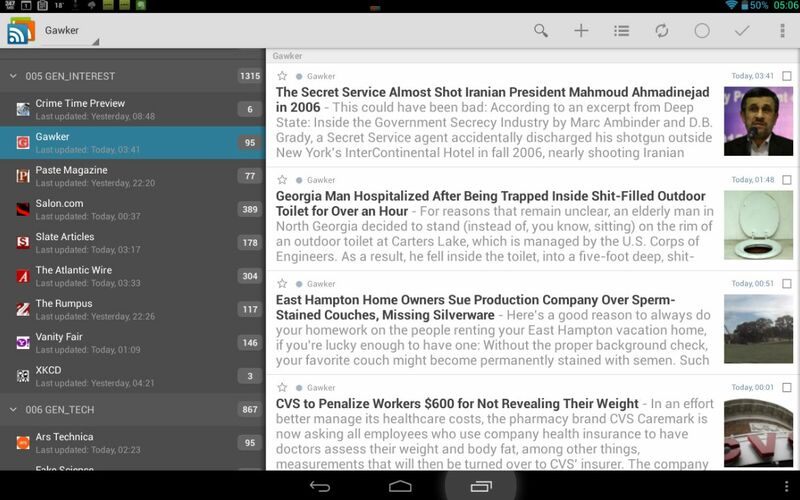 This screen-shot of Greader on my Asus Transformer gives you the idea I think. AND NOW THE F*CKERS WANT TO CLOSE GOOGLE READER DOWN. 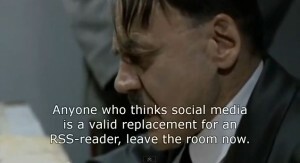 Hitler gives his opinion here, and I have to say, we are as one on this – I used pretty much the same language myself on hearing the news (and this was more relevant for me than his previous remarks on Sheffield United). But yet…….I have been a bit concerned for a while about my wholesale usage of Google reader. It is amazingly seductive, and impossible to keep up with. After some efforts over the last weeks I am down to under 3,000 unread articles, but it has been up to 6-8,000 at times. Most of it is inconsequential, but enough is interesting that it keeps me continuously trawling through the feeds, and refining my choice of sites. As a consequence, I had stopped reading books, a Bad Thing, and even before Google’s news, I had resolved to tilt the balance. So in some respects, the impending disaster may even be a good thing. In addition to knowing everything about you (see here, although the source of the complaints is a bit rich), Google are now summarily deciding what’s best for you as well. This time though, they might just be right. * NOTE: I know that conflict is a noun, not a verb. But ‘conflicted’ has no real English synonym, so occasionally, as here, it performs a useful task.